Create a uniform grid that overlays the mesh to be partitioned. Assign all elements within each cell of the grid to the same processor. Partitions the mesh by creating a grid in x,y,z and assigning each element of the mesh to a separate "cell" within the grid. This is useful when you have simple cartesian meshes and you just want to specify partitioning fairly directly. Sometimes a human is the best partitioner! 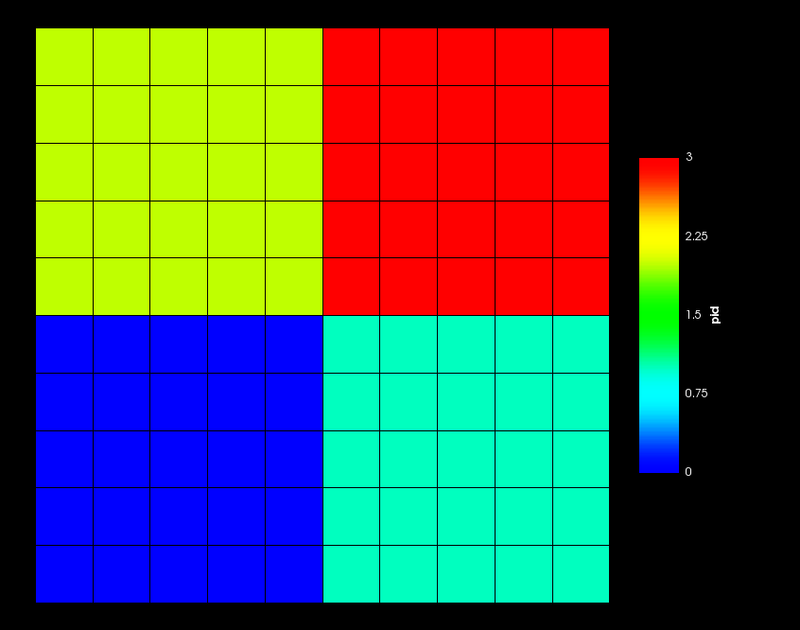 This is an example of a 2x2 grid partitioning for use on 4 processors. The number of cells (nx*ny*nz) MUST be equal to the number of MPI processes you're attempting to use! The GridPartitioner works by creating a GeneratedMesh for the "grid". That's the reason why this object takes similar input file parameters to a GeneratedMesh. The GeneratedMesh created by GridPartitioner is guaranteed to contain the original domain within it. To assign the processor IDs the centroid of each element of the mesh to be partitioned is searched for in the GeneratedMesh. The ID of the element of the GeneratedMesh that it lies within is then assigned as the processor_id.